So. We’ve been bike riding. After saving up, planning, and doing lots of research online and at various bike places (as well as picking the brains of our biking pals), Elizabeth and I decided to take the plunge and get ourselves some bikes. Of course, when you get a bike, you also have to buy a helmet, a tire pump, and water bottles. Not to mention a hitch and rack to carry the bikes from place to place. Ouch. Trying not to think about the sticker shock. But you know what? It was all worth it. At last we can keep up with our two boys on their bikes! And man, there’s nothing like getting on a bike and going FAST to really feel like a kid again. Wind in your hair, wheels humming, getting out of breath but pedaling FASTER. Totally worth the cost. 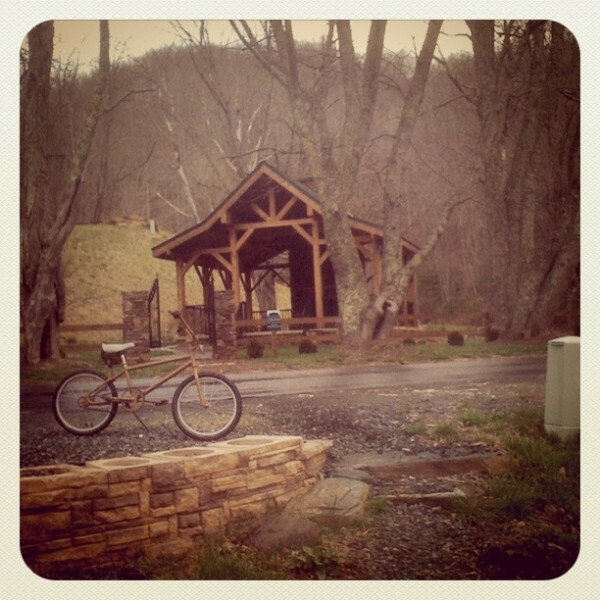 The shot above is taken from a “rain delay” during our 2nd bike outing from last weekend up in the mountains. That’s Drew’s sweet ride up there–cost us just $10 from a garage sale, plus $5 for the “gold” spray paint, and $20 for the new seat. Not a bad investment. So Mitch gets to help pedal, and he can keep up with the rest of us. He’s in an in-between age and size right now, so he has to pedal like crazy on his 12″ bike, but the 16″ bike he inherited from his cousin is too big. The trailer bike solves that problem. It also gives me an extra 50+ pounds to lug around behind me. 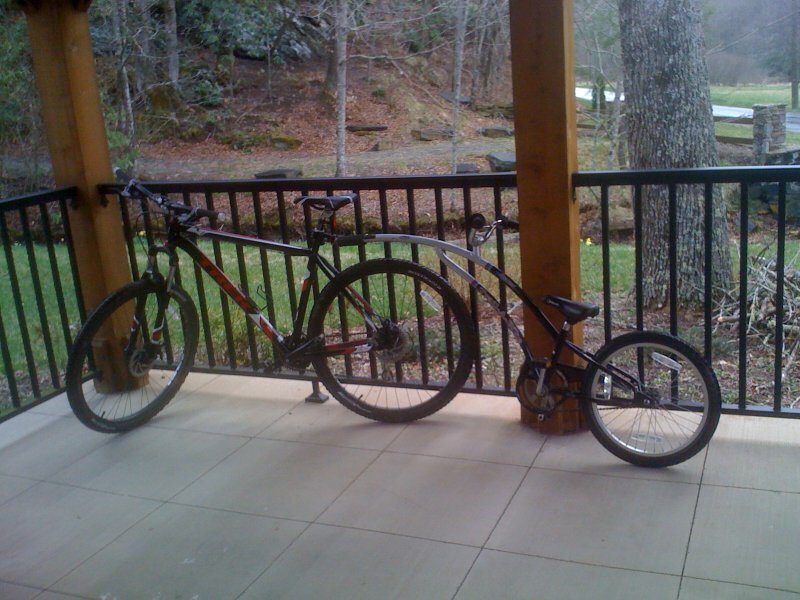 Luckily, Elizabeth’s bike is the exact same size as mine, so we can always switch bikes if we need to. In any case, Mitch makes a great traveling companion, as he’s always chatting away as he pedals, and he holds tight when we get rolling down the roads. Meanwhile, his big brother Drew is always in the lead, chugging away on his own bike. I think we thoroughly wore them both out this weekend. Not to mention ourselves. It’s been great having these new toys to play with, and after putting on over 20 miles on them last weekend in Boone, NC, and other locations in the mountains, I’m looking forward to the next ride. I’m feeling much younger already! The first pic really looked like it was from the 70’s! Had to read to figure that you took the pic! haha Its too early for me and I’m too blond today! We have to get our bikes going again. I miss going for these kind of rides. Loving the bikes. You should totally go riding again!